In small bowl, mix mayonnaise and mustard. Spread 1 tablespoon mayonnaise mixture on each of 4 slices of bread. 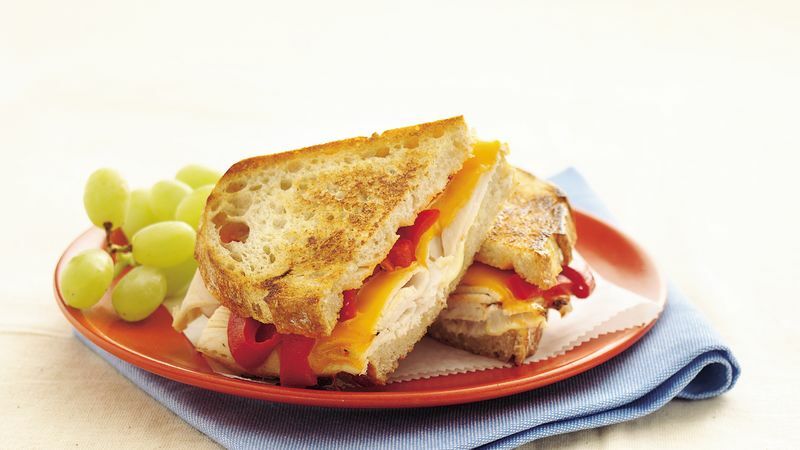 Top each evenly with turkey, cheese and roasted peppers. Cover with remaining slices of bread. Spray 12-inch skillet with cooking spray; place 2 sandwiches in skillet. Cover and cook over medium-low heat 2 minutes on each side or until bread is golden brown and cheese is melted. Repeat with remaining 2 sandwiches. If you prefer to grill these sandwiches in a contact grill, assemble them and place 1 or 2 on the hot bottom grill surface. Close the grill and cook the sandwiches about 3 minutes.